The first polio vaccine was the inactivated polio vaccine. It was developed by Jonas Salk and came into use in 1955. The oral polio vaccine was developed by Albert Sabin and came into commercial use in 1961. They are on the World Health Organization's List of Essential Medicines, the most effective and safe medicines needed in a health system. The wholesale cost in the developing world is about US$0.25 per dose for the oral form as of 2014. In the United States, it costs between $25 and $50 for the inactivated form. 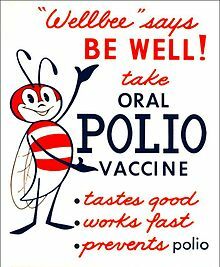 This 1963 poster featured CDC's national symbol of public health, the "Wellbee", encouraging the public to receive an oral polio vaccine. Interruption of person-to-person transmission of the virus by vaccination is important in the global polio eradication, since no long-term carrier state exists for poliovirus in individuals with normal immune function, polio viruses have no nonprimate reservoir in nature, and survival of the virus in the environment for an extended period of time appears to be remote. When the current formulation of IPV is used, 90% or more of individuals develop protective antibodies to all three serotypes of polio virus after two doses of inactivated polio vaccine (IPV), and at least 99% are immune to polio virus following three doses. The duration of immunity induced by IPV is not known with certainty, although a complete series is thought to provide protection for many years. Oral polio vaccines proved to be superior in administration, eliminating the need for sterile syringes and making the vaccine more suitable for mass vaccination campaigns. OPV also provided longer-lasting immunity than the Salk vaccine, as it provides both humoral immunity and cell-mediated immunity. One dose of OPV produces immunity to all three poliovirus serotypes in roughly 50% of recipients. Three doses of live-attenuated OPV produce protective antibodies to all three poliovirus types in more than 95% of recipients. OPV produces excellent immunity in the intestine, the primary site of wild poliovirus entry, which helps prevent infection with wild virus in areas where the virus is endemic. The live virus used in the vaccine can rarely shed in the stool and can rarely spread to others within a community. The live virus also has stringent requirements for transport and storage, which are a problem in some hot or remote areas. As with other live-virus vaccines, immunity initiated by OPV is probably lifelong. The trivalent (against wild types 1, 2, and 3) OPV has been used to nearly eradicate polio infection worldwide. Led by The Global Polio Eradication Initiative, 155 countries switched to use the bivalent (against wild type 1 and 3) between 17 April and 1 May 2016. The bivalent OPV is at more effective against type 1 and 3 but does not cover type 2. The United States as of 2017 continues to recommend the use of a trivalent version, but a fully inactivated version. In countries with endemic polio or where there is a high risk of imported cases, the WHO recommends OPV vaccine at birth followed by a primary series of 3 OPV and at least one IPV doses starting at 6 weeks of age, with a minimum of 4 weeks between OPV doses. In countries with >90% immunization coverage and low risk of importation, the WHO recommends one or two IPV doses starting at 2 months of age followed by at least two OPV doses, with the doses separated by 4–8 weeks depending on the risk of exposure. In countries with the highest levels of coverage and the lowest risks of importation and transmission, the WHO recommends a primary series of 3 IPV injections, with a booster dose after an interval of six months or more if the first dose was administered before 2 months of age. The inactivated polio vaccines are very safe. Mild redness or pain may occur at the site of injection. Oral polio vaccine results in vaccine-associated paralytic poliomyelitis in about three per million doses. They are generally safe to give during pregnancy and in those who have HIV/AIDS, but are otherwise well. A potential, but rare, adverse effect of the OPV is its known ability to recombine to a form that may cause neurological infection and cause paralysis. Clinical disease, including paralysis, caused by vaccine-derived poliovirus (VDPV) is indistinguishable from that caused by wild polioviruses. This is believed to be a rare event, but outbreaks of vaccine-associated paralytic poliomyelitis (VAPP), caused by a circulating vaccine-derived poliovirus (cVDPV), have been reported, and tend to occur in areas of low coverage by OPV, presumably because the OPV is itself protective against the related outbreak strain. 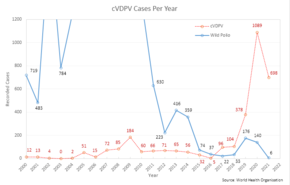 With wild polio cases at record lows, 2017 was the first year where more cases of cVDPV were recorded than the wild poliovirus, a trend that is expected to continue. In 1960, the rhesus monkey kidney cells used to prepare the poliovirus vaccines were determined to be infected with the Simian Virus-40. SV40 was also discovered in 1960 and is a naturally occurring virus that infects monkeys. In 1961, SV40 was found to cause tumors in rodents. More recently, the virus was found in certain forms of cancer in humans, for instance brain and bone tumors, pleural and peritoneal mesothelioma, and some types of non-Hodgkin's lymphoma. However, SV40 has not been determined to cause these cancers. SV40 was found to be present in stocks of the injected form of the polio vaccine (IPV) in use between 1955 and 1963. It is not found in the OPV form. Over 98 million Americans received one or more doses of polio vaccine between 1955 and 1963 when a proportion of vaccine was contaminated with SV40; an estimated 10–30 million Americans may have received a dose of vaccine contaminated with SV40. Later analysis suggested that vaccines produced by the former Soviet bloc countries until 1980, and used in the USSR, China, Japan, and several African countries, may have been contaminated, meaning hundreds of millions more may have been exposed to SV40. In 1998, the National Cancer Institute undertook a large study, using cancer case information from the institute's SEER database. The published findings from the study revealed no increased incidence of cancer in persons who may have received vaccine containing SV40. Another large study in Sweden examined cancer rates of 700,000 individuals who had received potentially contaminated polio vaccine as late as 1957; the study again revealed no increased cancer incidence between persons who received polio vaccines containing SV40 and those who did not. The question of whether SV40 causes cancer in humans remains controversial, however, and the development of improved assays for detection of SV40 in human tissues will be needed to resolve the controversy. During the race to develop an oral polio vaccine, several large-scale human trials were undertaken. By 1958, the National Institutes of Health had determined that OPV produced using the Sabin strains were the safest. Between 1957 and 1960, however, Hilary Koprowski continued to administer his vaccine around the world. In Africa, the vaccines were administered to roughly one million people in the Belgian territories (now the Democratic Republic of the Congo, Rwanda, and Burundi). The results of these human trials have been controversial, and unfounded accusations in the 1990s arose that the vaccine had created the conditions necessary for transmission of simian immunodeficiency virus from chimpanzees to humans, causing HIV/AIDS. These hypotheses, however, have been conclusively refuted. By 2004, cases of poliomyelitis in Africa had been reduced to just a small number of isolated regions in the western portion of the continent, with sporadic cases elsewhere. Recent local opposition to vaccination campaigns have evolved due to lack of adequate information, often relating to fears that the vaccine might induce sterility. The disease has since resurged in Nigeria and in several other African nations without necessary information, which epidemiologists believe is due to refusals by certain local populations to allow their children to receive the polio vaccine. The Salk vaccine, IPV, is based on three wild, virulent reference strains, Mahoney (type 1 poliovirus), MEF-1 (type 2 poliovirus), and Saukett (type 3 poliovirus), grown in a type of monkey kidney tissue culture (Vero cell line), which are then inactivated with formalin. The injected Salk vaccine confers IgG-mediated immunity in the bloodstream, which prevents polio infection from progressing to viremia and protects the motor neurons, thus eliminating the risk of bulbar polio and post-polio syndrome. In the United States, vaccine is administered along with the tetanus, diphtheria, and acellular pertussis vaccines (DTaP) and a pediatric dose of hepatitis B vaccine. In the UK, IPV is combined with tetanus, diphtheria, pertussis, and Haemophilus influenzae type b vaccines. OPV is an attenuated vaccine, produced by the passage of the virus through nonhuman cells at a subphysiological temperature, which produces spontaneous mutations in the viral genome. Oral polio vaccines were developed by several groups, one of which was led by Albert Sabin. Other groups, led by Hilary Koprowski and H.R. Cox, developed their own attenuated vaccine strains. In 1958, the National Institutes of Health created a special committee on live polio vaccines. The various vaccines were carefully evaluated for their ability to induce immunity to polio, while retaining a low incidence of neuropathogenicity in monkeys. Large-scale clinical trials performed in the Soviet Union in late 1950s to early 1960s by Mikhail Chumakov and his colleagues demonstrated safety and high efficacy of the vaccine. Based on these results, the Sabin strains were chosen for worldwide distribution. Fifty-seven nucleotide substitutions distinguish the attenuated Sabin 1 strain from its virulent parent (the Mahoney serotype), two nucleotide substitutions attenuate the Sabin 2 strain, and 10 substitutions are involved in attenuating the Sabin 3 strain. The primary attenuating factor common to all three Sabin vaccines is a mutation located in the virus's internal ribosome entry site, which alters stem-loop structures and reduces the ability of poliovirus to translate its RNA template within the host cell. The attenuated poliovirus in the Sabin vaccine replicates very efficiently in the gut, the primary site of infection and replication, but is unable to replicate efficiently within nervous system tissue. In 1961, type 1 and 2 monovalent oral poliovirus vaccine (MOPV) was licensed, and in 1962, type 3 MOPV was licensed. In 1963, trivalent OPV (TOPV) was licensed, and became the vaccine of choice in the United States and most other countries of the world, largely replacing the inactivated polio vaccine. A second wave of mass immunizations led to a further dramatic decline in the number of polio cases. Between 1962 and 1965, about 100 million Americans (roughly 56% of the population at that time) received the Sabin vaccine. The result was a substantial reduction in the number of poliomyelitis cases, even from the much-reduced levels following the introduction of the Salk vaccine. OPV is usually provided in vials containing 10–20 doses of vaccine. A single dose of oral polio vaccine (usually two drops) contains 1,000,000 infectious units of Sabin 1 (effective against PV1), 100,000 infectious units of the Sabin 2 strain, and 600,000 infectious units of Sabin 3. The vaccine contains small traces of antibiotics—neomycin and streptomycin—but does not contain preservatives. In a generic sense, vaccination works by priming the immune system with an 'immunogen'. Stimulating immune response, by use of an infectious agent, is known as immunization. The development of immunity to polio efficiently blocks person-to-person transmission of wild poliovirus, thereby protecting both individual vaccine recipients and the wider community. The development of two polio vaccines led to the first modern mass inoculations. The last cases of paralytic poliomyelitis caused by endemic transmission of wild virus in the United States occurred in 1979, with an outbreak among the Amish in several Midwest states. Two separate teams, led by John Kolmer and Maurice Brodie respectively, developed polio vaccines and reported their results at the annual meeting of the American Public Health Association in November 1935. Despite promising results, both were cancelled as a result of the angry reaction from other researchers, as vaccinated children had died in both studies; no researchers dared attempt a polio vaccine for another 20 years. Professor John Kolmer, MD (1886–1962), of Temple University in Philadelphia, presented his findings first. He had developed an attenuated poliovirus vaccine, which he tested in about 10,000 children across much of the United States and Canada. Five of these children died of polio and 10 more were paralyzed, usually in the arm where the vaccine was injected, and frequently affecting children in towns where no polio outbreak had occurred. He had no control group, but asserted that many more children would have gotten sick. The response from other researchers was uncharacteristically blunt; one of them directly called Kolmer a murderer. Maurice Brodie, MD (1903–1939), a young researcher at New York University and the New York City Health Department, presented his results afterwards, but the feelings of the researchers were already unfavorable before he started because of Kolmer's report. Brodie and his team had prepared a formaldehyde-killed poliovirus vaccine, testing it first on himself and five co-workers, and eventually on 7,500 children and adults, with another 4,500 people serving as a control group. In the control group, Brodie reported that one out of 900 developed polio; in the group receiving the vaccine, only one out of 7,500 developed polio, making the vaccine 88% effective during the first year. However, other researchers believed that the one case was likely caused by the vaccine, and two more possible cases were reported later. After this meeting, Brodie, whose polio vaccine was at least partially effective and reasonably safe, and who developed several ground-breaking ideas about vaccination whose validity was confirmed two decades later with the development of the Salk vaccine, was immediately fired and had trouble finding employment again. Brodie died three and a half years later. Kolmer, an established researcher whose vaccine was unsafe and probably ineffective, kept his job, was given a second appointment as professor of medicine at the Temple University School of Dentistry the next year, continued to publish research papers, and received multiple awards throughout his academic career. A breakthrough came in 1948 when a research group headed by John Enders at the Children's Hospital Boston successfully cultivated the poliovirus in human tissue in the laboratory. This group had recently successfully grown mumps in cell culture. In March 1948, Thomas H. Weller was attempting to grow varicella virus in embryonic lung tissue. He had inoculated the planned number of tubes when he noticed that there were a few unused tubes. He retrieved a sample of mouse brain infected with polio virus and added it to the remaining test tubes, on the off chance that the virus might grow. The varicella cultures failed to grow, but the polio cultures were successful. This development greatly facilitated vaccine research and ultimately allowed for the development of vaccines against polio. Enders and his colleagues, Thomas H. Weller and Frederick C. Robbins, were recognized in 1954 for their labors with a Nobel Prize in Physiology or Medicine. Other important advances that led to the development of polio vaccines were: the identification of three poliovirus serotypes (Poliovirus type 1 — PV1, or Mahoney; PV2, Lansing; and PV3, Leon); the finding that prior to paralysis, the virus must be present in the blood; and the demonstration that administration of antibodies in the form of gamma globulin protects against paralytic polio. During the early 1950s, polio rates in the U.S. were above 25,000 annually; in 1952 and 1953, the U.S. experienced an outbreak of 58,000 and 35,000 polio cases, respectively, up from a typical number of some 20,000 a year, with deaths in those years numbering 3,200 and 1,400. Amid this U.S. polio epidemic, millions of dollars were invested in finding and marketing a polio vaccine by commercial interests, including Lederle Laboratories in New York under the direction of H. R. Cox. Also working at Lederle was Polish-born virologist and immunologist Hilary Koprowski of the Wistar Institute in Philadelphia, who tested the first successful polio vaccine, in 1950. His vaccine, however, being a live attenuated virus taken orally, was still in the research stage and would not be ready for use until five years after Jonas Salk's polio vaccine (a dead-virus injectable vaccine) had reached the market. Koprowski's attenuated vaccine was prepared by successive passages through the brains of Swiss albino mice. By the seventh passage, the vaccine strains could no longer infect nervous tissue or cause paralysis. After one to three further passages on rats, the vaccine was deemed safe for human use. On 27 February 1950, Koprowski's live, attenuated vaccine was tested for the first time on an 8-year-old boy living at Letchworth Village, an institution for the physically and mentally disabled located in New York. After the child suffered no side effects, Koprowski enlarged his experiment to include 19 other children. The first effective polio vaccine was developed in 1952 by Jonas Salk and a team at the University of Pittsburgh that included Julius Youngner, Byron Bennett, L. James Lewis, and Lorraine Friedman, which required years of subsequent testing. Salk went on CBS radio to report a successful test on a small group of adults and children on 26 March 1953; two days later, the results were published in JAMA. Beginning 23 February 1954, the vaccine was tested at Arsenal Elementary School and the Watson Home for Children in Pittsburgh, Pennsylvania. 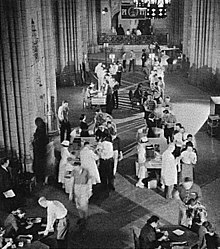 Salk's vaccine was then used in a test called the Francis Field Trial, led by Thomas Francis, the largest medical experiment in history at that time. The test began with about 4,000 children at Franklin Sherman Elementary School in McLean, Virginia, and eventually involved 1.8 million children, in 44 states from Maine to California. By the conclusion of the study, roughly 440,000 received one or more injections of the vaccine, about 210,000 children received a placebo, consisting of harmless culture media, and 1.2 million children received no vaccination and served as a control group, who would then be observed to see if any contracted polio. The results of the field trial were announced 12 April 1955 (the tenth anniversary of the death of President Franklin D. Roosevelt, whose paralytic illness was generally believed to have been caused by polio). The Salk vaccine had been 60–70% effective against PV1 (poliovirus type 1), over 90% effective against PV2 and PV3, and 94% effective against the development of bulbar polio. Soon after Salk's vaccine was licensed in 1955, children's vaccination campaigns were launched. In the U.S, following a mass immunization campaign promoted by the March of Dimes, the annual number of polio cases fell from 35,000 in 1953 to 5,600 by 1957. By 1961 only 161 cases were recorded in the United States. A week earlier in April 1955, Pierre Lépine at the Pasteur Institute in Paris also announced an effective polio vaccine. In April 1955, soon after mass polio vaccination began in the US, the Surgeon General began to receive reports of patients who contracted paralytic polio about a week after being vaccinated with Salk polio vaccine from Cutter pharmaceutical company, with the paralysis limited to the limb the vaccine was injected into. In response the Surgeon General pulled all polio vaccine made by Cutter Laboratories from the market, but not before 250 cases of paralytic illness had occurred. Wyeth polio vaccine was also reported to have paralyzed and killed several children. It was soon discovered that some lots of Salk polio vaccine made by Cutter and Wyeth had not been properly inactivated, allowing live poliovirus into more than 100,000 doses of vaccine. 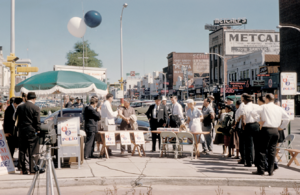 In May 1955, the National Institutes of Health and Public Health Services established a Technical Committee on Poliomyelitis Vaccine to test and review all polio vaccine lots and advise the Public Health Service as to which lots should be released for public use. These incidents reduced public confidence in polio vaccine leading to a drop in vaccination rates. At the same time that Salk was testing his vaccine, both Albert Sabin and Hilary Koprowski continued working on developing a vaccine using live virus. During a meeting in Stockholm to discuss polio vaccines in November 1955, Sabin presented results obtained on a group of 80 volunteers, while Koprowski read a paper detailing the findings of a trial enrolling 150 people. 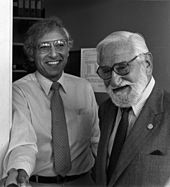 Sabin and Koprowski both eventually succeeded in developing vaccines. Because of the commitment to the Salk vaccine in America, Sabin and Koprowski both did their testing outside the United States, Sabin in Mexico and then in the Soviet Union, and Koprowski in the Congo and Poland. In 1957, Sabin developed a trivalent vaccine, containing attenuated strains of all three types of poliovirus. In 1959, ten million children in the Soviet Union received the Sabin oral vaccine. For this work, Sabin was given the medal of the Order of Friendship Among Peoples, described as the Soviets' highest civilian honor, despite having become an American during the height of the cold war. Sabin's oral vaccine using live virus came into commercial use in 1961. 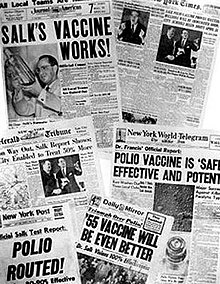 Once Sabin’s oral vaccine became widely available, it supplanted Salk’s injected vaccine, which had been tarnished in the public's opinion by the Cutter incident, in which Salk vaccines prepared by one company resulted in several children dying or becoming paralyzed. An enhanced-potency IPV was licensed in the United States in November 1987, and is currently the vaccine of choice there. The first dose of polio vaccine is given shortly after birth, usually between 1 and 2 months of age, and a second dose is given at 4 months of age. The timing of the third dose depends on the vaccine formulation, but should be given between 6 and 18 months of age. A booster vaccination is given at 4 to 6 years of age, for a total of four doses at or before school entry. In some countries, a fifth vaccination is given during adolescence. Routine vaccination of adults (18 years of age and older) in developed countries is neither necessary nor recommended because most adults are already immune and have a very small risk of exposure to wild poliovirus in their home countries. In 2002, a pentavalent (five-component) combination vaccine (called Pediarix) containing IPV was approved for use in the United States. A global effort to eradicate polio, led by the World Health Organization, UNICEF, and the Rotary Foundation, began in 1988 and has relied largely on the oral polio vaccine developed by Albert Sabin and Mikhail Chumakov (Sabin-Chumakov vaccine). Polio was eliminated in the Americas by 1994. The disease was officially eliminated in 36 Western Pacific countries, including China and Australia, in 2000. Europe was declared polio-free in 2002. Since January 2011, no cases of the disease have been reported in India, hence in February 2012, the country was taken off the WHO list of polio-endemic countries. In March 2014, India was declared a polio-free country. Although poliovirus transmission has been interrupted in much of the world, transmission of wild poliovirus does continue and creates an ongoing risk for the importation of wild poliovirus into previously polio-free regions. If importations of poliovirus occur, outbreaks of poliomyelitis may develop, especially in areas with low vaccination coverage and poor sanitation. As a result, high levels of vaccination coverage must be maintained. In November 2013, the WHO announced a polio outbreak in Syria. In response, the Armenian government put out a notice asking Syrian Armenians under age 15 to get the polio vaccine. As of 2014, polio virus has spread to 10 countries, mainly in Africa, Asia, and the Middle East, with Pakistan, Syria, and Cameroon advising vaccinations to outbound travelers. Polio vaccination programs have received resistance from some people in Pakistan, Afghanistan, and Nigeria (the three countries as of 2017 with remaining polio cases). Some Muslim religious leaders believe that the vaccines are secretly being used for sterilization of Muslims. The fact that the CIA organized a fake vaccination program in 2011 to help find Osama Bin Laden is an additional cause of distrust. In 2015, the WHO announced a deal with the Taliban to encourage them to distribute the vaccine in areas they control. However, on 11 September 2016, two unidentified gunmen associated with the Pakistani Taliban, Jamaat-ul-Ahrar, shot Zakaullah Khan, a doctor who was administering polio vaccines in Pakistan. The leader of the Jamaat-ul-Ahrar claimed responsibility for the shooting and says that the group will continue to keep doing these kinds of attacks. This resistance to and skepticism of vaccinations has consequently slowed down the polio eradication process within the three remaining countries. The wholesale cost is about US$0.25 per dose for the oral form as of 2014. The Global Alliance for Vaccines and Immunization supplies the inactivated vaccine to developing countries for as little as €0.75 (about US$0.85) per dose in 10-dose vials. In the United States, the inactivated form costs between $25 and $50. A widespread misconception has arisen in Pakistan that polio vaccine contained haram ingredients and could cause impotence and infertility in male children, leading some parents not to have their children vaccinated. This belief is most prevalent in the Khyber Pakhtunkhwa province and the FATA region. Attacks on polio vaccination teams have also occurred, thereby hampering international efforts to eradicate polio in Pakistan and globally, since the virus can be carried by travelers. ^ a b c d e f g h i j k l "Polio vaccines: WHO position paper – March, 2016" (PDF). Releve Epidemiologique Hebdomadaire. 91 (12): 145–68. March 2016. PMID 27039410. Archived (PDF) from the original on 3 June 2016. ^ Aylward RB (2006). "Eradicating polio: today's challenges and tomorrow's legacy". Annals of Tropical Medicine and Parasitology. 100 (5–6): 401–13. doi:10.1179/136485906X97354. PMID 16899145. ^ Schonberger LB, Kaplan J, Kim-Farley R, Moore M, Eddins DL, Hatch M (1984). "Control of paralytic poliomyelitis in the United States". Reviews of Infectious Diseases. 6 Suppl 2: S424–6. doi:10.1093/clinids/6.Supplement_2.S424. PMID 6740085. ^ "Global Wild Poliovirus 2014 - 2019" (PDF). Retrieved 3 February 2019. ^ "Does polio still exist? Is it curable?". World Health Organization. Retrieved 2018-05-21. ^ "Poliomyelitis". World Health Organization. Archived from the original on 18 April 2017. Retrieved 25 April 2017. ^ Bazin H (2011). Vaccination: A History. John Libbey Eurotext. p. 395. ISBN 9782742007752. Archived from the original on 8 September 2017. ^ Smith DR, Leggat PA (2005). "Pioneering figures in medicine: Albert Bruce Sabin--inventor of the oral polio vaccine". The Kurume Medical Journal. 52 (3): 111–6. doi:10.2739/kurumemedj.52.111. PMID 16422178. ^ a b "Vaccine, Polio". International Drug Price Indicator Guide. Archived from the original on 28 February 2017. Retrieved 6 December 2015. ^ a b Hamilton R (2015). Tarascon Pocket Pharmacopoeia 2015 Deluxe Lab-Coat Edition. Jones & Bartlett Learning. p. 316. ISBN 978-1-284-05756-0. ^ a b Fine PE, Carneiro IA (November 1999). "Transmissibility and persistence of oral polio vaccine viruses: implications for the global poliomyelitis eradication initiative". American Journal of Epidemiology. 150 (10): 1001–21. doi:10.1093/oxfordjournals.aje.a009924. PMID 10568615. Archived from the original on 12 October 2007. ^ Koike S, Taya C, Kurata T, Abe S, Ise I, Yonekawa H, Nomoto A (February 1991). "Transgenic mice susceptible to poliovirus". Proceedings of the National Academy of Sciences of the United States of America. 88 (3): 951–5. Bibcode:1991PNAS...88..951K. doi:10.1073/pnas.88.3.951. PMC 50932. PMID 1846972. ^ a b Robertson, Susan. "Module 6: Poliomyelitis" (PDF). The Immunological Basis for Immunization Series. World Health Organization (Geneva, Switzerland). Archived from the original (PDF) on 24 March 2006. Retrieved 29 November 2008. ^ a b c d e f Atkinson W, Hamborsky J, McIntyre L, Wolfe S, eds. (2008). Epidemiology and Prevention of Vaccine-Preventable Diseases (The Pink Book) (PDF) (10th ed. (2nd printing) ed.). Washington, D.C.: Public Health Foundation. Archived from the original (PDF) on 24 September 2008. Retrieved 29 November 2008. ^ a b "Poliomyelitis prevention: recommendations for use of inactivated poliovirus vaccine and live oral poliovirus vaccine. American Academy of Pediatrics Committee on Infectious Diseases". Pediatrics. 99 (2): 300–5. February 1997. doi:10.1542/peds.99.2.300. PMID 9024465. ^ a b Marin M, Patel M, Oberste S, Pallansch MA (January 2017). "Guidance for Assessment of Poliovirus Vaccination Status and Vaccination of Children Who Have Received Poliovirus Vaccine Outside the United States". MMWR. Morbidity and Mortality Weekly Report. 66 (1): 23–25. doi:10.15585/mmwr.mm6601a6. PMC 5687270. PMID 28081056. ^ Al Idrus A (13 April 2016). "Worldwide switch to bivalent oral polio vaccine to kick off on Sunday". fiercepharma.com. Archived from the original on 15 April 2016. Retrieved 1 May 2016. ^ Ramirez Gonzalez A, Farrell M, Menning L, Garon J, Everts H, Hampton LM, Dolan SB, Shendale S, Wanyoike S, Veira CL, Châtellier GM, Kurji F, Rubin J, Boualam L, Chang Blanc D, Patel M (July 2017). "Implementing the Synchronized Global Switch from Trivalent to Bivalent Oral Polio Vaccines-Lessons Learned From the Global Perspective". The Journal of Infectious Diseases. 216 (suppl_1): S183–S192. doi:10.1093/infdis/jiw626. PMC 5854099. PMID 28838179. ^ "Polio vaccines: WHO position paper, January 2014" (PDF). Releve Epidemiologique Hebdomadaire. 89 (9): 73–92. February 2014. PMID 24707513. Archived (PDF) from the original on 21 May 2014. ^ Shimizu H, Thorley B, Paladin FJ, Brussen KA, Stambos V, Yuen L, Utama A, Tano Y, Arita M, Yoshida H, Yoneyama T, Benegas A, Roesel S, Pallansch M, Kew O, Miyamura T (December 2004). "Circulation of type 1 vaccine-derived poliovirus in the Philippines in 2001". Journal of Virology. 78 (24): 13512–21. doi:10.1128/JVI.78.24.13512-13521.2004. PMC 533948. PMID 15564462. ^ Cono J, Alexander LN (2002). "Chapter 10: Poliomyelitis" (PDF). Vaccine-Preventable Disease Surveillance Manual (3rd ed.). Archived from the original (PDF) on 22 October 2011. ^ "What is vaccine-derived polio?". Online Q&A – WHO. October 2014. Archived from the original on 7 September 2015. Retrieved 6 September 2015. ^ Kew O, Morris-Glasgow V, Landaverde M, Burns C, Shaw J, Garib Z, et al. (April 2002). "Outbreak of poliomyelitis in Hispaniola associated with circulating type 1 vaccine-derived poliovirus". Science. 296 (5566): 356–9. Bibcode:2002Sci...296..356K. doi:10.1126/science.1068284. PMID 11896235. ^ Yang CF, Naguib T, Yang SJ, Nasr E, Jorba J, Ahmed N, Campagnoli R, van der Avoort H, Shimizu H, Yoneyama T, Miyamura T, Pallansch M, Kew O (August 2003). "Circulation of endemic type 2 vaccine-derived poliovirus in Egypt from 1983 to 1993". Journal of Virology. 77 (15): 8366–77. doi:10.1128/JVI.77.15.8366-8377.2003. PMC 165252. PMID 12857906. ^ "Eradication of polio – Is Syria being left behind? | School of Public Health and Community Medicine". sphcm.med.unsw.edu.au. Retrieved 2018-10-06. ^ a b c d "Simian Virus 40 (SV40), Polio Vaccine, and Cancer". Vaccine Safety. Centers for Disease Control. 22 April 2004. Archived from the original on 22 May 2013. Retrieved 22 May 2013. ^ Eddy BE, Borman GS, Berkeley WH, Young RD (May 1961). "Tumors induced in hamsters by injection of rhesus monkey kidney cell extracts". Proceedings of the Society for Experimental Biology and Medicine. Society for Experimental Biology and Medicine. 107: 191–7. doi:10.3181/00379727-107-26576. PMID 13725644. ^ Carbone M (December 1999). "Simian virus 40 and human tumors: It is time to study mechanisms". Journal of Cellular Biochemistry. 76 (2): 189–93. doi:10.1002/(SICI)1097-4644(20000201)76:2<189::AID-JCB3>3.0.CO;2-J. PMID 10618636. ^ Vilchez RA, Kozinetz CA, Arrington AS, Madden CR, Butel JS (June 2003). "Simian virus 40 in human cancers". The American Journal of Medicine. 114 (8): 675–84. doi:10.1016/S0002-9343(03)00087-1. PMID 12798456. ^ a b Engels EA (April 2005). "Cancer risk associated with receipt of vaccines contaminated with simian virus 40: epidemiologic research". Expert Review of Vaccines. 4 (2): 197–206. doi:10.1586/14760584.4.2.197. PMID 15889993. ^ Bookchin D (7 July 2004). "Vaccine scandal revives cancer fear". New Scientist. Archived from the original on 20 July 2004. Retrieved 29 November 2008. ^ Strickler HD, Rosenberg PS, Devesa SS, Hertel J, Fraumeni JF, Goedert JJ (January 1998). "Contamination of poliovirus vaccines with simian virus 40 (1955-1963) and subsequent cancer rates". JAMA. 279 (4): 292–5. doi:10.1001/jama.279.4.292. PMID 9450713. ^ Olin P, Giesecke J (1998). "Potential exposure to SV40 in polio vaccines used in Sweden during 1957: no impact on cancer incidence rates 1960 to 1993". Developments in Biological Standardization. 94: 227–33. PMID 9776244. ^ a b c d e f "Competition to develop an oral vaccine". Conquering Polio. Sanofi Pasteur SA. 2 February 2007. Archived from the original on 7 October 2007. ^ a b Plotkin SA (April 2001). "CHAT oral polio vaccine was not the source of human immunodeficiency virus type 1 group M for humans". Clinical Infectious Diseases. 32 (7): 1068–84. doi:10.1086/319612. PMID 11264036. ^ a b c Koprowski H (July 1960). "Historical aspects of the development of live virus vaccine in poliomyelitis". British Medical Journal. 2 (5192): 85–91. doi:10.1136/bmj.2.5192.85. PMC 2096806. PMID 14410975. ^ Collins, Huntly (6 November 2000). "The Gulp Heard Round the World". The Philadelphia Inquirer. pp. Section D, page 1. Archived from the original on 5 April 2004. Retrieved 29 November 2008. ^ "Nigeria Muslims oppose polio vaccination". Africa. BBC News. 27 June 2002. Archived from the original on 29 November 2008. Retrieved 29 November 2008. ^ Dugger CW, McNeil DG (20 March 2006). "Rumor, Fear and Fatigue Hinder Final Push to End Polio". The New York Times. Archived from the original on 10 December 2008. Retrieved 29 November 2008. ^ "Anti-polio vaccine Malians jailed". Africa. BBC News. 12 May 2005. Archived from the original on 10 January 2006. Retrieved 29 November 2008. ^ a b Jegede AS (March 2007). "What led to the Nigerian boycott of the polio vaccination campaign?". PLoS Medicine. 4 (3): e73. doi:10.1371/journal.pmed.0040073. PMC 1831725. PMID 17388657. ^ a b c Kew OM, Sutter RW, de Gourville EM, Dowdle WR, Pallansch MA (2005). "Vaccine-derived polioviruses and the endgame strategy for global polio eradication". Annual Review of Microbiology. 59: 587–635. doi:10.1146/annurev.micro.58.030603.123625. PMID 16153180. ^ a b c Joint Committee on Vaccination and Immunisation (2006). "26: Poliomyelitis" (PDF). In Salisbury D, Ramsay M, Noakes K. Immunisation Against Infectious Disease. Edinburgh: Stationery Office. pp. 313–29. ISBN 978-0-11-322528-6. Archived from the original (PDF) on 15 June 2007. ^ a b Sabin AB, Ramos-Alvarez M, Alvarez-Amezquita J, Pelon W, Michaels RH, Spigland I, Koch MA, Barnes JM, Rhim JS (August 1960). "Live, orally given poliovirus vaccine. Effects of rapid mass immunization on population under conditions of massive enteric infection with other viruses". JAMA. 173 (14): 1521–6. doi:10.1001/jama.1960.03020320001001. PMID 14440553. ^ Sabin AB (1987). "Role of my cooperation with Soviet scientists in the elimination of polio: possible lessons for relations between the U.S.A. and the USSR". Perspectives in Biology and Medicine. 31 (1): 57–64. doi:10.1353/pbm.1987.0023. PMID 3696960. ^ Benison S (1982). "International medical cooperation: Dr. Albert Sabin, live poliovirus vaccine and the Soviets". Bulletin of the History of Medicine. 56 (4): 460–83. PMID 6760938. ^ Ochs K, Zeller A, Saleh L, Bassili G, Song Y, Sonntag A, Niepmann M (January 2003). "Impaired binding of standard initiation factors mediates poliovirus translation attenuation". Journal of Virology. 77 (1): 115–22. doi:10.1128/JVI.77.1.115-122.2003. PMC 140626. PMID 12477816. ^ Gromeier M, Bossert B, Arita M, Nomoto A, Wimmer E (February 1999). "Dual stem loops within the poliovirus internal ribosomal entry site control neurovirulence". Journal of Virology. 73 (2): 958–64. PMC 103915. PMID 9882296. ^ Pearce JM (November 2004). "Salk and Sabin: poliomyelitis immunisation". Journal of Neurology, Neurosurgery, and Psychiatry. 75 (11): 1552. doi:10.1136/jnnp.2003.028530. PMC 1738787. PMID 15489385. ^ Smallman-Raynor M (2006). Poliomyelitis: A World Geography: Emergence to Eradication. Oxford University Press, USA. ISBN 978-0-19-924474-4. ^ Poliomyelitis Eradication: Field Guide. Washington: Pan American Health Organization. 2006. ISBN 978-92-75-11607-4. ^ a b c d e f g h i j k l Offit PA (2007). The Cutter Incident: How America's First Polio Vaccine Led to the Growing Vaccine Crisis. Yale University Press. p. 38. ISBN 978-0-300-12605-1. ^ "John A. Kolmer, M.D." Retrieved 28 November 2017. ^ Enders JF, Weller TH, Robbins FC (January 1949). "Cultivation of the Lansing Strain of Poliomyelitis Virus in Cultures of Various Human Embryonic Tissues". Science. 109 (2822): 85–7. Bibcode:1949Sci...109...85E. doi:10.1126/science.109.2822.85. PMID 17794160. ^ "The Nobel Prize in Physiology or Medicine 1954". The Nobel Foundation. Archived from the original on 19 December 2008. Retrieved 29 November 2008. ^ Hammon WM, Coriell LL, Wehrle PF, Stokes J (April 1953). "Evaluation of Red Cross gamma globulin as a prophylactic agent for poliomyelitis. IV. Final report of results based on clinical diagnoses". Journal of the American Medical Association. 151 (15): 1272–85. PMID 13034471. ^ Ochmann S, Roser M (9 November 2017). "Polio- Polio Cases (OWID based on US Public Health Service (1910-1951) and US Center for Disease Control (1960-2010))". ourworldindata.org. Retrieved 26 March 2018. ^ Fox M (20 April 2013). "Hilary Koprowski, Who Developed First Live-Virus Polio Vaccine, Dies at 96". The New York Time. ^ "Public Health Weekly Reports for OCTOBER 10, 1947". Public Health Reports. 62 (41): 1467–1498. October 1947. PMC 1995293. PMID 19316151. ^ Koprowski H (15 October 2010). "Interview with Hilary Koprowski, sourced at History of Vaccines website". College of Physicians of Philadelphia. Archived from the original on 15 May 2016. Retrieved 15 October 2010. ^ Shors T (14 March 2008). Understanding viruses. Jones & Bartlett Learning. pp. 294–. ISBN 978-0-7637-2932-5. Archived from the original on 21 July 2014. Retrieved 22 February 2011. ^ Conis E (2016). "Political Ills". Distillations. 2 (2): 34–37. Retrieved 27 March 2018. ^ Oshinsky D (Winter 2010). "Miracle Workers". American Heritage. ^ "Polio Victory Remembered as March of Dimes Marks 50th Anniversary of Salk Vaccine Field Trials". News Desk. 26 April 2004. Archived from the original on 27 September 2015. Retrieved 14 November 2014. ^ Smith JS (1990). Patenting the Sun: Polio and the Salk Vaccine. William Morrow & Co. ISBN 978-0-688-09494-2. ^ Sorem A, Sass EJ, Gottfried G (1996). Polio's legacy: an oral history. Washington, D.C: University Press of America. ISBN 978-0-7618-0144-3. ^ Hinman AR (June 1984). "Landmark perspective: Mass vaccination against polio". JAMA. 251 (22): 2994–6. doi:10.1001/jama.1984.03340460072029. PMID 6371280. ^ The Pasteur Institute stated that an antipoliomyelitis vaccine, developed by Professor Pierre Lepine would soon be produced in large quantities. (Times, London, 4 April 1955). ^ Pasteur, Archives. "Pierre Lépine (1901–1989) – Notice biographique". webext.pasteur.fr. Archived from the original on 28 November 2016. Retrieved 28 November 2016. ^ Juskewitch JE, Tapia CJ, Windebank AJ (August 2010). "Lessons from the Salk polio vaccine: methods for and risks of rapid translation". Clinical and Translational Science (Review). 3 (4): 182–5. doi:10.1111/j.1752-8062.2010.00205.x. PMC 2928990. PMID 20718820. ^ a b "Two Vaccines: Sabin and Salk". Smithsonian National Museum of American History. ^ "Sabin receives highest Soviet civilian honor". U.P.I. archives. 20 November 1986. ^ Mansoor H (23 October 2015). "Can India's social mobilisation strategy work in Pakistan?". The Express Tribune. Archived from the original on 24 October 2015. Retrieved 24 October 2015. ^ Mastny L (25 January 1999). "Eradicating Polio: A Model for International Cooperation". Worldwatch Institute. Archived from the original on 3 December 2006. Retrieved 29 November 2008. ^ a b Centers for Disease Control Prevention (CDC) (October 1994). "Certification of poliomyelitis eradication--the Americas, 1994". MMWR. Morbidity and Mortality Weekly Report. Centers for Disease Control and Prevention. 43 (39): 720–2. PMID 7522302. Archived from the original on 21 May 2017. ^ "General News. Major Milestone reached in Global Polio Eradication: Western Pacific Region is certified Polio-Free". Health Educ Res. 16 (1): 109–114. 2001. doi:10.1093/her/16.1.109. ^ D' Souza RM, Kennett M, Watson C (2002). "Australia declared polio free". Communicable Diseases Intelligence Quarterly Report. 26 (2): 253–60. PMID 12206379. ^ Ray K (26 February 2012). "India wins battle against dreaded polio". Deccan Herald. ^ "India polio-free for a year: 'First time in history we're able to put up such a map'". The Telegraph. 26 February 2012. Archived from the original on 27 February 2012. Retrieved 26 February 2012. 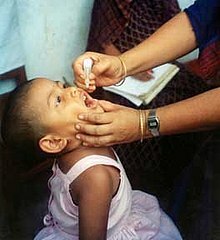 ^ "India three years polio-free". South-East Asia Regional Office. Archived from the original on 1 March 2017. Retrieved 19 February 2017. ^ Barron L (4 November 2013). "Armenian Health Ministry: Syrian Armenian children need polio vaccine". CISTran Finance. Archived from the original on 19 December 2013. Retrieved 18 December 2013. ^ De Vivo DC, Ryan MM, Jones HR, Darras BT (2014). Neuromuscular Disorders of Infancy, Childhood, and Adolescence: A Clinician's Approach. Elsevier Science. p. 161. ISBN 978-0-12-417127-5. Archived from the original on 23 April 2017. ^ a b "Pakistan polio official killed in Peshawar: police". The Daily Star: Lebanon. 11 September 2016. Archived from the original on 11 September 2016. Retrieved 11 September 2016. ^ Najafizada E (15 December 2015). "Taliban Join Global Effort to Kill Off Polio in 2016". Bloomberg.com. Archived from the original on 28 February 2017. ^ "Availability and price of inactivated polio vaccine". The Global Polio Eradication Initiative. Archived from the original on 11 April 2015. ^ "BBC NEWS – South Asia – Impotence fears hit polio drive". bbc.co.uk. 25 January 2007. Archived from the original on 9 October 2015. Retrieved 15 December 2015. ^ Junaidi I (14 January 2015). "Lab tests show polio vaccine is not 'Haram'". dawn.com. Archived from the original on 22 December 2015. Retrieved 15 December 2015. Global Polio Eradication Initiative final project to eliminate polio by 2018.